It's that wonderful time of year! Crunch time. The state tests are just around the corner. In Ohio, our state tests are the last week of April and the first week of May. Last year, our school analyzed our results and realized that written response was one of our major weaknesses. As a result, I developed the following lesson. I noticed that my students were already burnt out on practice tests. In fact, one student mentioned that he had done the same practice test with three different teachers! Can you tell that the teachers are stressed about test prep?! So to mix things up, I began pulling several short stories from EBSCOhost. I have chosen a wide range of texts, including nonfiction, folktales, realistic fiction, and fantasy. Another great place to find articles is the teacher's section at the Highlights website. (Just click on the link!) Did you know that NAEP actually uses some Highlights stories? I figured if they are good enough for NAEP, they are good enough for me! Next, we wrote a couple of written responses together, making sure to follow our guidelines. Then, students had a chance to try writing their response independently. 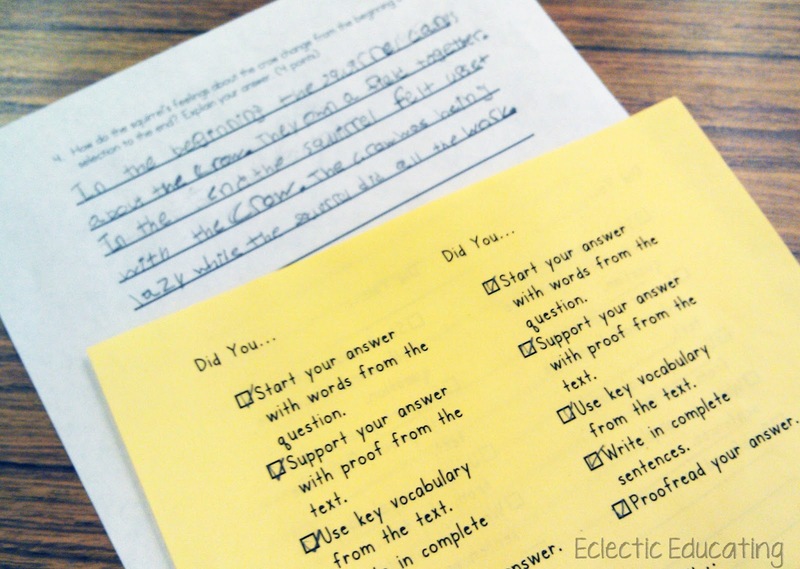 Once students had finished their responses, they used the checklist below to self-assess. 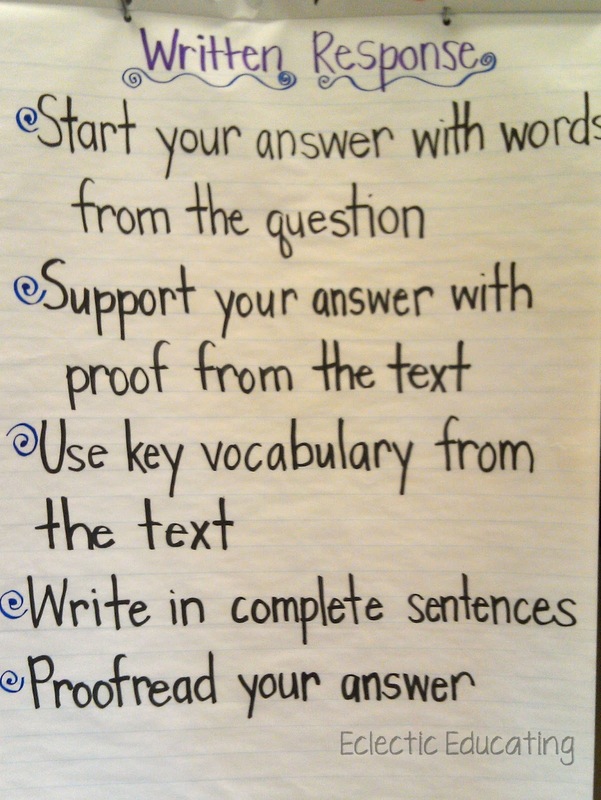 The checklist consists of the guidelines from the anchor chart. If you would like your own copy of the checklist, click on the image below. 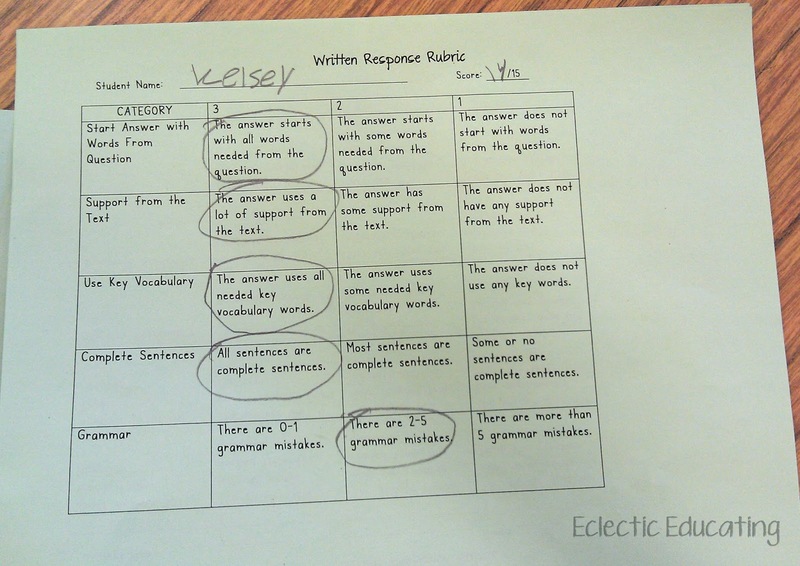 Once students had self-assessed and corrected any mistakes, they were ready to trade with a partner. To assess their partner, they used the rubric below. Once again, the rubric included the guidelines from the anchor chart. If you would like a copy of the rubric, click the image below! We continued to practice this process with several written response questions. This skill is still a work in progress, but I was very impressed with my students. I feel like they are really clear on what a good written response looks like. For the most part, they only make a couple of grammar mistakes. How do you all try and put a fresh spin on test prep? Our ESL tests are coming up soon- I've been doing a lot of sneaky listening and speaking activities without them knowing they are actually test prep! Love this post! Actually about to do some inservice with teachers about writing! Definitely would love to share this post with them! I really want to see a close up view of your rubric ... when I click on the image, it doesn't seem clickable. Just wanted to give you a heads up! Love this post! 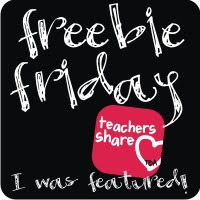 I just stumbled onto your blog - and am so glad that I did! We are just starting our preparation for THE test - these strategies will prove very helpful. You are so kind! Thank you! Best of luck to you as you prepare for THE test! I'm a stay at home mom, but I remember those testing days when I was a teacher... way to work at improving your kids' writing! Woohoo! I'm your 100th follower! One fun way I teach my kids to start their answer with part of the question is to ask ridiculous questions like "Why are all unicorns purple?" and "How can you prove that Skittles are a fruit?" They have so much fun with it! My students never seem to remember to start their answer with words forms the question. I like your anchor chart and rubric. It is hard to believe it is test prep season again! With the checklist, I finally don't have to repeat myself, reminding them every time!